Most of the comments and suggestions previously given herein have referred to processes used to work plastics in home workshops and schools, where a variety of single pieces was planned, rather than a quantity of any one style. 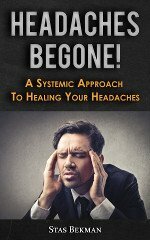 As might be imagined, entirely different methods are used in quantity-production shops. None of the companies manufacturing cast resins make any finished merchandise—merely the raw materials. These materials are purchased by "fabricators" who turn out the costume jewelry you see in the stores, or make up the percolator-handles and other objects used by other manufacturers to ornament their wares. The equipment of fabricating shops is fairly uniform, consisting of "slicers", rod and button machines, screw machines, (hand and automatic), die-presses, drill-presses, carving spindles, jig-saws, abrasive cut-off wheels, sanding discs and belts, band-saws and tumbling barrels. In nine cases out of ten, the fabricating shop works from a special shape, especially designed and cast for the job in hand, since the runs are usually large enough to warrant the cost of a special mold. 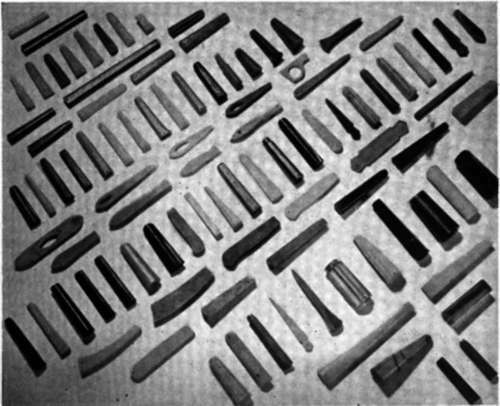 These range through a wide variety of all possible conceivable designs, from an anchor for a breastpin to a cast knife-handle, the object of the special shape being not only to save machining costs, but to save material as well, as the material is bought by the pound, and the scrap as well as the saw-dust is wasted. The equipment used and methods followed will vary with the job of course. To follow one typical article through a fabricator's plant, we will illustrate and describe the making of knife-handles from cast resin special shapes. Plate 2G illustrates a few of the many shapes in which these handles are available—long and short, fat and thin, grooved and plain. Still another shape is available—a long bar having the cross-section of a knife-handle, which is sliced up into the proper widths, polished and drilled, making a complete handle. This type of course has flat sides and no grooves or ornamentation, while the individually-cast handles have. The tapered individually-cast handles range from 7 to about 40 to the pound, depending on the size. The first operation in fabricating these little castings into handles is removing the "flash" and rounding the large end, the small end near the knife-blade usually being cast to exact shape and size. The upper end of any cast resin casting has a sort of hard, glassy scale on it, called the "flash end" and this must always be removed by sawing or grinding. The handles are usually mounted in a special jig which just fits them and are passed under an abrasive cut-off wheel by hand, Plate 2H. They are then laid on the table of a disc-sander, either one at a time or stacked in a jig, and with an arc-like motion of the hand, given a rounded end. Plate 2J, shows this operation, the speed being about six gross an hour. The next step is tumbling, usually done in three stages. The first stage, "cutting down" removes tool-marks and sharp corners, and requires about 24 hours in a maple-lined tumbling barrel travelling about 30 R.P.M., loaded with pumice and shoe-pegs. These latter are small maple pegs about a half-inch long and an eighth of an inch in diameter, and the tumbling motion sets thousands of these little pegs to work digging away at the plastics, loaded with pumice. After this stage, the load in the tumbling barrel is dumped in a seive, the pumice and pegs passing through and leaving only the handles, which after cleaning are then put back into another barrel, loaded with pegs and a finer grade of abrasive. This corresponds to the buffing stage previously described for hand-polishing and continues about 48 hours, thousands of them being buffed at once. The third stage, after again dumping and separating the handles, and possibly cleaning them by giving them a short tumble with kerosene-soaked sawdust, consists of another 24-hour run with sawdust or pegs and wax. Various polishing processes are followed in different plants and on different articles, depending on quantity, size and degree of finish required. 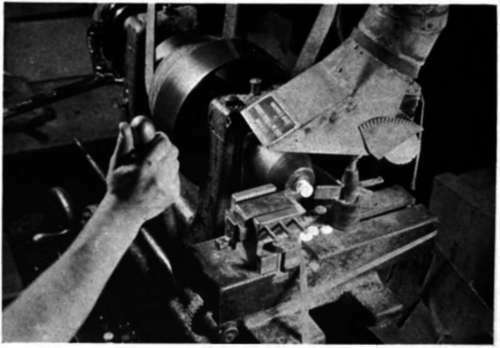 Unless the wax usually used in the final process, is subsequently removed by a touch against a clean buffing-wheel, (Plate 2V), it leaves a dull finish when the handles are subsequently heated in order to soften the material to permit the handle of this knife-blade being forced into the drilled hole. This final touch on the dry wheel can be accomplished at the rate of about 6 gross an hour by hand. The only other operation usually done on handles is the drilling of the hole for the tang or shank of the knife-handle. 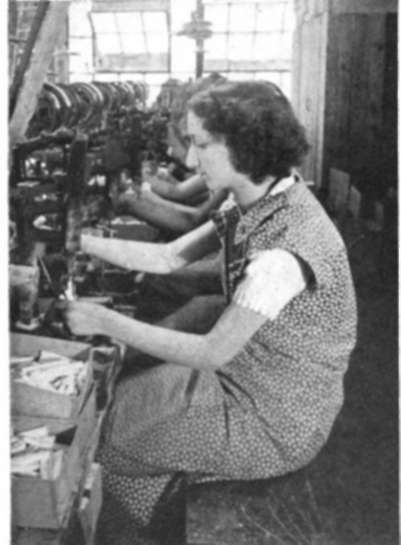 This is usually done by girls using a suitable jig in an ordinary drill-press, handling about two gross an hour. Plate 2K. When left in water or other liquids a few moments at around 200 degrees F., the material softens sufficiently to allow it to expand. 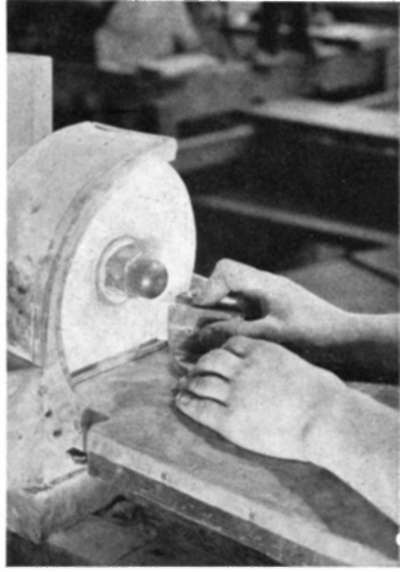 Then after the insertion of the steel tang, it shrinks on cooling, forming an extremely strong joint without cement and with a minimum of labor. The heat of dishwashing or othar common uses seldom softens the material sufficiently to allow the handle to come loose. Plate 2L illustrates the equipment used in inserting these handles. Occasionally, a lead or die-cast "bolster" is slipped over the steel tang before it is placed in the hole, which "gives" a little as the plastic cools and grips it. The handles are shown, hole and down, in a pan of heated water at the operator's left. The blades are inserted in one side of the little press shown, and the handle in the other, and a pull at the lever presses the two together. 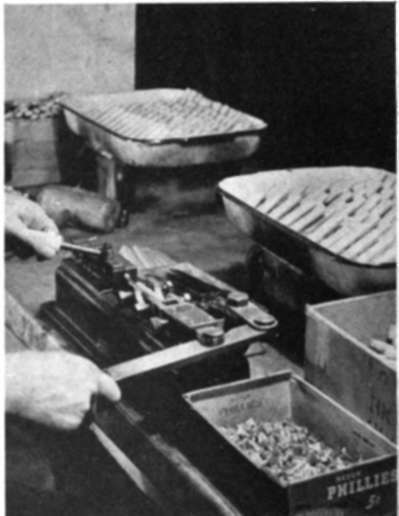 By that time the plastic has cooled and shrunk, and the knife is completed, and tossed into the box in front of the operator. 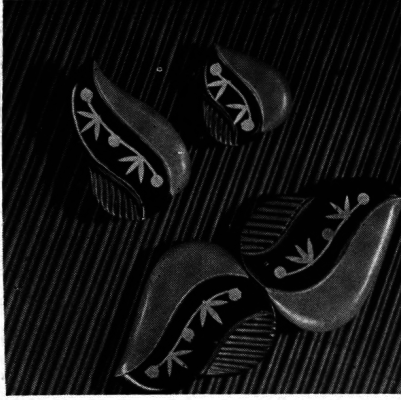 This type of handle is now being widely used on cutlery, manicure sets, umbrellas and many other articles, and the use of cast resin allows the manufacturer much greater freedom than any other material, as designs can be changed at a moment's notice with little more expense than a few dollars for new jigs. Use of this material permits inexpensive try-outs of new designs, and a quick step-up into quantity production, and the abandonment of slow lines involves no junking of expensive dies or equipment. PLATE 2D. (Above). Another home-made carving set-up, consisting of a cutter mounted on the end of a fraction-h.p. 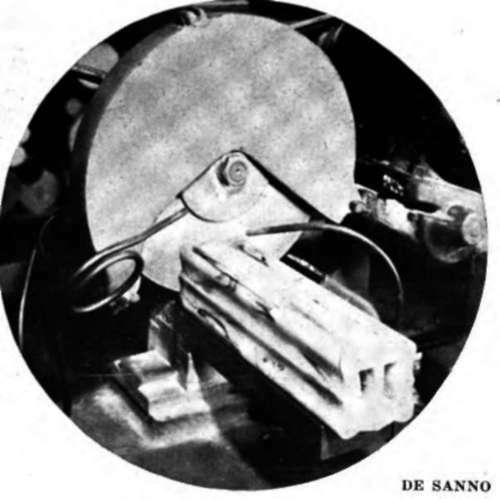 motor-spindle. PLATE 2E. (Upper left). Turning; a gang; of carving-cutters at once, on a metal-working; lathe. PLATE 2F. (Left). Examples of costume jewelry using; the new inlaid (molten) metal process. PLATE 2G. (Below). Some of the many shapes in which cast resin handles are available. PLATES 2H, 2J, 2K, 2L. 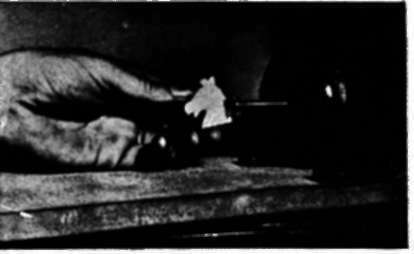 In order, cutting: off the "flash" end of the hand'e-casting with a hi-speed abrasive cut-off wheel; rounding- the ends of half a dozen handles held in a jig, on a disc-sander; drilling: the holes for the tang's; inserting- the tangs with a hand-press, after the handle has been softened by heating. PLATE 2M. (Above). 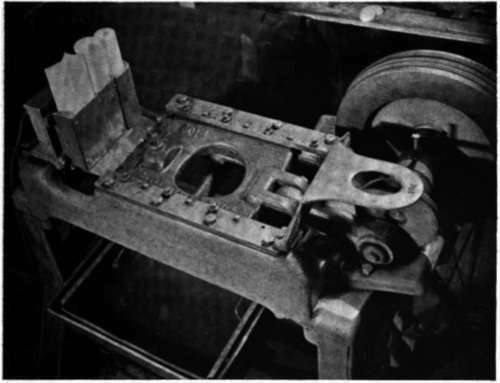 Another model of hi-speed abrasive cut-off wheel, slicing; buckles from a special-shaped casting:. PLATE 2N. (Below). A "slicer" slicing- off poker chips, buttons, etc.. by means of a reciprocating- knife, after the material has been softened by heating:... The knife is shown just entering- the plastic shapes, held in the holder at the left. PLATE 2P. (Above). 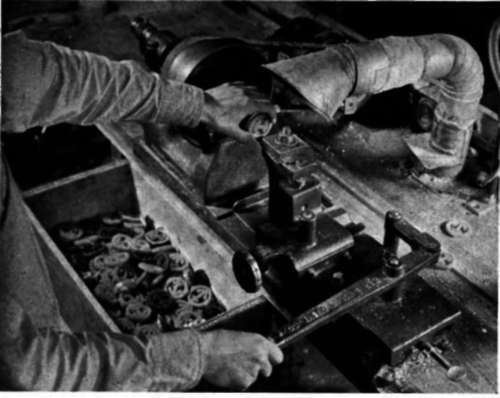 A facing-lathe, in which the cut-off pieces are inserted one at a time, faced, and grooves turned in the face. PLATE 2Q. (Below). 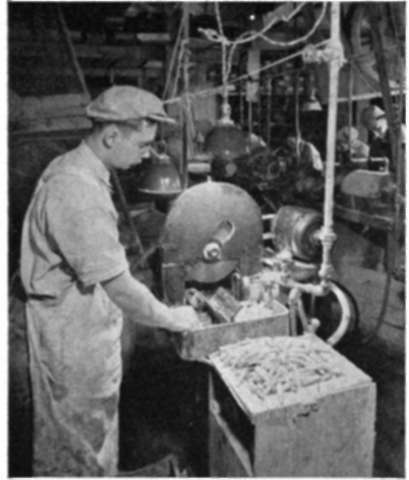 A "rod machine". 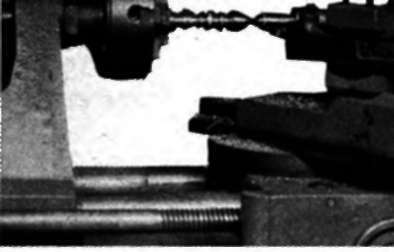 The round rod is automatically fed thru the spindle from the left, and the hand-lever works various shapes of facing, rounding and cut-off tools in rotation.